Tween is either the fifth studio album from duo Wye Oa, or a collection of outtakes that they have reworked into a coherent statement. I have seen it referred to both ways here and there. The fact is that the eight songs on Tween were composed between 2011 and 2014, but for whatever reason the band decided they did not belong on either Civilian or Shriek. Both of those albums were pretty great as is, so they might be on to something there. But Jenn Wasner and Andy Stack decided to rework these songs for Tween. Their label, Merge, says, "It should join the pantheon of amazing not-albums of history whose names try to downplay how good they actually are, like R.E.M.’s Dead Letter Office, The Who’s Odds and Sods, maybe even Dinosaur Jr.’s Whatever’s Cool With Me." So in the label’s opinion, this is a collection, not an album. This nomenclature discussion is kind of academic and, let's face it: it doesn't matter. What matters is that Tween is eight songs in about 35 minutes. Let's go over them. 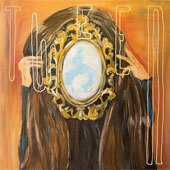 Tween starts off with Out of Nowhere, a song wherein Wye Oak sound like Loscil. That is a sentence i never would have contemplated, but the first minute or so of this tune is mellow dub, with sounds wavering and ebbing. The song coheres after a while, and you hear Wasner singing, faintly, as synths pulse and drumming scatters about. The song meanders along slowly, then just kind of fades out. After the mellow and dubby Out of Nowhere has lulled the listener into a calm place, Wye Oak bring in bright, sparkly pop music with a New Wave twist. If You Should See is almost jarring after that opener, but it is a happy pop tune. Wasner sings high in her register as the song surges with a sparkly New Wave trill of drums and echoing guitar. Lovely. Wasner's guitar chimes in No Dreaming in a way that reminds me of the 1980s. Stack taps along on his drums as Wasner sings a lovely little melody. This tune is catchy and happy. Wye Oak get bluesier for Too Right, the voice distorted, the guitar an angry chiming, and the drumming a scattered noise. This reminds me of some of their earlier work. Better (For Esther) starts with an insistent guitar riff, then synths and loops come in and the whole song becomes a little hazy. Wasner sings airily. This is an odd but pretty song. And then, at the end, it just explodes with hand claps, the guitar going crazy, and synths all over the place. A nice transition. Synths waver in On Luxury and there is a really nice bass riff wandering around. On the chorus the song really pops into a bright shimmering pop tune. Trigger Finger starts off quieter, with the guitar chiming and Wasner's voice subtle and understated. The song slowly grows into a lovely mess with the drums chugging, the guitar chiming, and horns (i think) swelling. And finally we wrap things up with Watching the Waiting, a bouncy pop song that just skips along, bringing the record to a close. It is a very satisfying and catchy album, and it is over too soon. I continue to be impressed with Wye Oak. And remember, this is the stuff they cast aside when recording their last record. Even more impressive when viewed in that light.